Moving fast and being prepared for GST – A comprehensive guide for businesses to take action today to build competitive advantage in the light of GST implementation. GST is an evolution of the current tax regime, transforming the complex and cascading structure into a unified value added system of taxation. Under this, a value added tax would be levied at every point of the supply chain providing for credit for any/all taxes paid previously. GST would be levied simultaneous by the Centre and State (CGST and SGST respectively). All essential characteristics in terms of its structure, design applicability, etc. would be common between CGST and SGST, across all states. While GST implementation would bring ease of business through simplified processes, companies would have to aggressively prepare to fully adapt to the new GST rules and regulations. Companies that move early to prepare for GST will be able to create a competitive advantage over others. Key decisions need to be taken across all areas of an organisation's supply chain. A. Sourcing/Purchasing – Supplier decisions in relation to manufacturing sites, purchase categories, price renegotiations; Areas where supplier consolidation can be leveraged; Long term supplier contracts along with relevant legal implications. B. Manufacturing – Decisions on plant set-up, re-location; plant expansion, closure; exploring profitability of contract manufacturing in comparison to self manufacturing (make vs. buy); impact of the new competitive scenario on the manufacturing strategy. C. Transportation and Distribution – Distribution Centre(DC) requirements and optimal product flow; product and market decisions; exploring direct shipments vs. stock transfers; warehouse consolidation; negotiating long term logistics partnerships. D. Customers and Markets – Projecting current and future demand clusters; product pricing decisions; working capital changes in relation to the new business scenario. E. Warehousing – Warehouse optimization in relation to own vs. lease and self managing vs. outsourcing decisions. 1. Relook at manufacturing locations based on current and potential customer location. 2. Determine the sourcing strategy and vendor partners, and identify which are short/long term partners. 3. Determine the GST based distribution network. This would determine the location and size of warehouses. 4. Decide the locations which need to be invested in for competency development, warehousing infrastructure, software, and new transport partners. What are the current taxes that will be replaced with the implementation of GST? 3. How would GST impact a business? Implementation of GST will have significant impact and will change the manner in which business is carried out in comparison to the current tax regime. With a single rate being applied to all goods and services, there will be a significant redistribution of taxes across all categories resulting in reduction in taxes on manufactured goods and hence impacting the pricing of the product. The integration of tax on Goods and Services through GST would provide the additional benefit of providing credit for service tax paid by manufacturers. Both CENVAT & VAT which are in practice now, give tax credit to the manufacturer for the tax paid for raw materials (hence a tax is charged only on the value added by the manufacturer). More often than not, there are various services including logistics involved in getting the input material to its final customers. Service tax is paid on the cost of such services. With the implementation of GST, cost of any service, including logistics, will be considered a value add, and the manufacturer will get tax credit for the service tax paid. Under GST inter-state sales transactions between two dealers would be cost equivalent compared with stock transfers / branch transfers. According to the proposed model, centre would levy IGST which would be CGST plus SGST on all interstate transactions of taxable goods and services. The inter-state seller will pay IGST on value addition after adjusting available credit of IGST, CGST, and SGST on his purchases. Similarly the importing dealer will claim credit of IGST while discharging his output tax liability in his own State. This will result in inter-state sales transaction becoming tax neutral when compared to intra-state sales. India would become one single common market no longer divided by state borders. Logistics and supply chains will therefore see a major change; sourcing, distribution and warehousing decisions which are currently planned based on state level tax avoidance mechanisms instead of operational efficiencies will be reorganized to leverage efficiencies of scale, location and other factors relevant to the business. GST would eliminate the existing penalties on interstate sales transactions and facilitate consolidation of vendors and suppliers. This will eliminate the need to have state wise warehouses to avoid CST and the associated paperwork, leading to elimination of one extra, redundant level of warehousing in the supply chain. This will result in a reduction in the number of warehouses, improved efficiencies, better control and reduction in inventory due to lesser numbers of stocking points and cases of stock outs. This would allow a firm to take advantage of economies of scale and consolidate warehouses at the same time reduce capital deployed in the business. Larger warehouses can benefit from technological sophistication by deploying state-of-the-art planning and warehousing systems which are not feasible in smaller, scattered warehouses. At the same time IT costs of having ERPs deployed at many small warehouses can be saved. This will pave the way for improved service levels at lower cost in the overall supply chain. A rationalization similar to warehousing can also be done in distribution and transportation routes as tax ceases to become the deciding factor. Since the tax rates across states are envisaged to be uniform, state boundaries will no longer be the parameter for deciding routes. At the same time, with larger warehouses, transportation lot sizes will automatically increase, making way for more efficient bigger trucks. 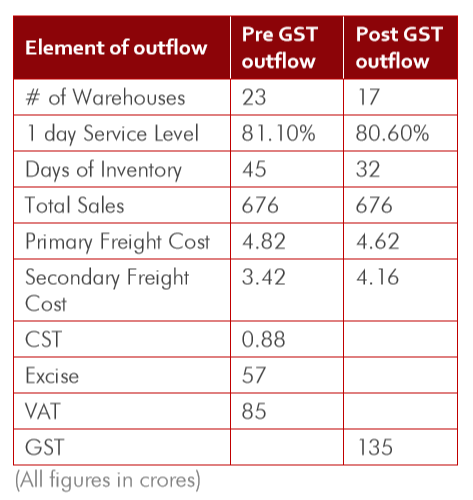 The optimization and rationalization that these options can bring about in the supply chains of a firm on account of GST will provide a competitive advantage to the business through better service and faster turnaround times at lower costs. Organizations will now be able to explore different distribution models such as setting up mother warehouse and regional distribution hubs and possibly step away from traditional C&F and distributor based models currently adopted. This will lead to logistics and distribution to evolve more strongly as a competitive advantage. The government has already begun the process of amending the constitution and getting the necessary consensus from all the stake holders. Thus GST offers a great opportunity to revisit your Supply Chain & Distribution strategy, and identify what is required to become GST ready. Those who move early are likely to gain an advantage on cost and service levels over their competitors and deliver a better value proposition to the customer. 1. What aspects of business, technology, and people will get impacted? 2. How to ensure that the future state fulfills the current business objectives as well? 3. What external factors should one include in doing such an analysis? 4. Once impacts are identified, how to drive them to their rightful conclusion in the organisation? a) What is the 'Trade Margin' you want your business partner to earn? b) What is the 'no of days' inventory' do you want your business partners to carry? c) In how many days of 'date of order' do you want to replenish the stocks of your business partners? d) How many days of inventory do you want to keep in your own warehouses? e) What is the potential geography, hitherto unexplored, which you would now want to exploit, and how much is the potential? a) What weight/volume will move with what frequency on which lane? b) Which lorry type would be the most economical, to carry these loads. How many such vehicles would be required with what frequency? 4. Start a discussion with Transport Service Providers, to arrive at Transportation contract. Bear in mind, these would be new lanes, and different for each business. 5. Redefine your Organization structure, reallocate resources, hire new people at new locations, and redefine Sales territory. 7. Based on GST, reshape Invoice format as well as entire accounting. 8. Based on the outcome of point1 above, decide if shifting Manufacturing locations and/or Vendor locations, would either save money in Transport, reduce inventory, or improve Service levels.